DXO just released their Zeiss Batis 85mm f/1.8 test results and it looks like a good balance between price/performance for portraiture. 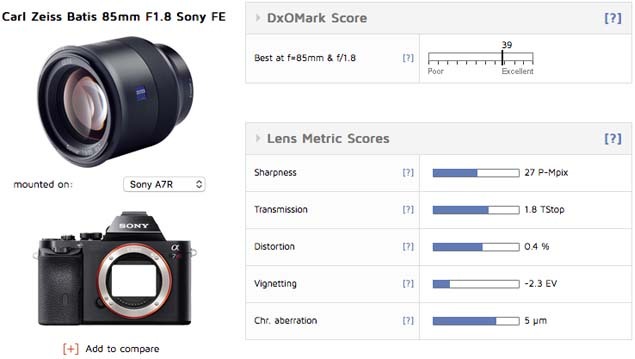 This isn’t the sharpest lens you can put on a Sony A7, but it’s close enough for 99% of shooting. The design of the Batis lenses have interested me since their announcement and I hope to pick one up in the near future. Hopefully we will see how the Batis compares to the Sony FE 85mm F1.4 GM soon. This entry was posted in Reviews, Sony a7 II, Sony a7R II, Sony a7S II, Sony lenses and tagged Zeiss Batis 85mm f/1.8. Bookmark the permalink. Trackbacks are closed, but you can post a comment.